This post belongs to a series about search engine optimization (SEO) with Magnolia CMS. Today we look at categorizing content. Usability and SEO go hand-in-hand. Categorizing content allows visitors to find related and similar content with ease. Logical, keyword-rich categories provide intuitive navigation of a large collection of content. Categorization offers a range of opportunities to improve internal linking, visibility, and keyword density. Common uses of categories are tag clouds, and links to overview and landing pages. Although content tagging is an effective technique, tag clouds in particular have been abused. Bloggers saw them as a keyword-stuffing opportunity, and search engines have developed techniques to combat this trend. 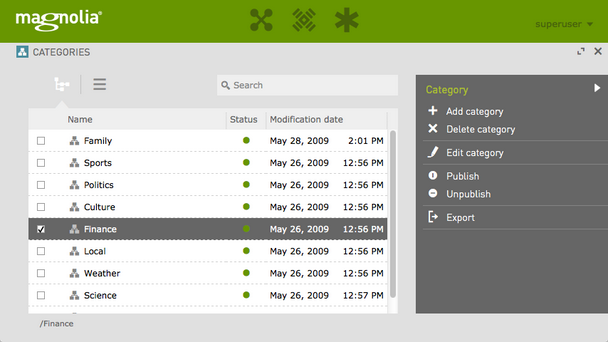 Magnolia allows you to create custom categorization taxonomies. You can tag articles with categories to support browsing of related content. This feature can be extended and adapted to suit your needs.